I know I shouldn’t – I’ve done this before in the festive season, ‘reviewed’ a book that I haven’t finished reading. But really, this one is such a perfect Christmas gift and already it’s December 8th. If I left telling you about it till I’d finished reading it, it would be the day before Christmas Day and you would be gnashing your teeth that it was too late to get a copy for the chocolate-lover in your life. 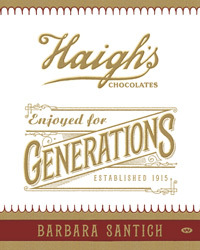 Needless to say, the book should be accompanied by a box of chocolates, because it’s the history of our very own, Australian-owned chocolatier, Haigh’s. (If you’re reading this from overseas, perhaps you could hassle your supplier into importing some). As this lively book explains, Haigh’s has been making chocolates for 100 years, and this book was written for its 2015 centenary. Even more usefully, Alf acquired the manual Chocolate and Confectionery Manufacture – which was crucial to Haigh’s success because in those days confectioners also sold fruit and vegetables and he was not a trained confectioner. He soon realised that the niche for chocolate was still open because most of the manufacturing confectioners concentrated on sweets – boiled sweets, toffees, fondants and liquorice and there were only three who made chocolate. Hardly anybody produced chocolate from raw ingredients and those that did were in Perth, Sydney and Melbourne (our very own MacRobertson’s Chocolates, sadly now no longer Australian owned). Chapter 2 traces the history of chocolate, brought to Spain in 1585 and in the beginning mostly made into drinks, flavoured (as the Aztecs did) with chilli, vanilla and allspice. (So those strange-looking versions of chocolate with chilli are not so eccentric after all, who knew?) By the 17th century chocolate had begun its career as an accessory to seduction at the court of Versailles, and it was becoming more affordable for ordinary mortals like you and me. It was a Dutch genius called Coenraad Van Houten who invented the press that made chocolate into a powder easier to mix with hot milk, and then *drum roll* in 1819 the bar of eating chocolate was invented, the French and the Brits taking the honours (and probably still arguing over the laurels.) The chocolate bar was born only 30 years before our hero Alfred Haigh was born. There are not a lot of good things can be said about wars of any kind and World War 1 in particular, but the British ban on confectionery exports and a corresponding embargo on imports into Australia was an impetus for the Australian industry to get going, and it benefited also from tariffs on imported chocolate after the war. Contrary to the ‘competition is good’ mantra that we hear all the time today, the loss of competition encouraged Alf to introduce new product lines and for his business to be profitable. Soon Alf was doing well enough to build the imposing Haigh Mansions at Henley Beach in the 1920s (is it still there?) and more shops. The Empire was growing! As you’d expect with publications from Wakefield Press – who IMO are rivalled only by Finlay Lloyd and the Folio Soicety in the beautiful books stakes – the pictures in Enjoyed for Generations are sumptuous. There are full colour reproductions of those beautiful paintings that grace the lids of posh boxes of chocolates and it’s lavishly illustrated (both colour and B&W) all the way through. There are great photos of the first buildings and the vintage moulds Haigh used, and also the quaint old delivery vans, not to mention the life-sized knights-in-armour that once stood guard at the entrance to Haigh’s Beehive Corner Shop. (Today they are at the Haigh’s Visitor Centre in Parkside, now on my bucket list next time I visit South Australia). There’s also a list of awards won by Haigh’s, references and an index. Well, I’ve finished reading the book now, and have learned some interesting snippets. Who knew that eating chocolate could help save endangered species? Any excuse to eat chocolate is a good one, IMO, but how nice to know that part of the profits from sales of Haigh’s Easter bilby goes towards research into biological control of those pesky rabbits, and that sales of a chocolate Murray Cod supports Healthy Rivers Australia! Like many other businesses Haigh’s is involved in all sorts of community initiatives, but one of the best is the development of cocoa-bean growing in PNG, and you can buy PNG Single Origin milk chocolate the way you can buy wine from a single origin vineyard. Does anyone else remember the trayboys selling chocolate and sweets at the pictures? There was a time when any hopeful young man would bring a box of chocolates for his lady friend when they went to the pictures, and I loved the bustle at interval as the trayboys raced to get to everyone before the feature started again. The chapter about Haigh’s theatre concessions is especially interesting, because it traces the rise of cinema in the early years of the 20th century, its decline with the advent of television, and the eventual departure of Haigh’s from this type of selling, replaced, alas by those grotesque mega-boxes of popcorn. How I loathe the stink and sound of them when someone sits near me with one of these, ruining the picture until finally they reach the bottom of the box! Although a commissioned history like this isn’t going to be a critique, reading between the lines shows that management has made its share of mistakes, missing the occasional opportunity, setting up in the wrong location from time to time, and misjudging the market sometimes, as they did with their attempts to sell to Japanese tourists in Queensland. But overall, this family owned company has thrived and I think we should be proud of any company that’s still Australian-owned amongst so many that have been lost to international companies. The last few pages of the book feature the entire 2015 range of chocolates … guaranteed to tempt the reader back to the Haigh’s website to order some more! and bound to be in lots of bookshops as well…. Oh, you made me laugh with your comment about Haighs being located next to your dentist. Is this the shop in the arcade? (Block?) I think I’ve been there. Very attractive shop. Indeed it is! Dear old Dr Coakley is retired now, but I used to go up in the lift and get my teeth checked and cleaned, and then go straight down to Haigh’s and buy delicious chocolates to spoil myself with on the way home on the train. And I still have all my own teeth so clearly Haigh’s chocolates are beneficial to dental health…. Now that would be very nice. I could clear out plenty of space in the sitting room, enough, say, to fit a crate or three…. Yes the Haigh Mansions are still there..i think they rent 8 rooms.